Fernandez, R. and Maecker, H. T. (2015). Cytokine-stimulated Phosphoflow of PBMC Using CyTOF Mass Cytometry. Bio-protocol 5(11): e1496. DOI: 10.21769/BioProtoc.1496. Phosphorylation of tyrosine, serine, and threonine residues is critical for the control of protein activity involved in various cellular events. An assortment of kinases and phosphatases regulate intracellular protein phosphorylation in many different cell signaling pathways. These pathways include T and B cell signaling, regulating growth and cell cycle control, plus cytokine, chemokine, and stress responses. 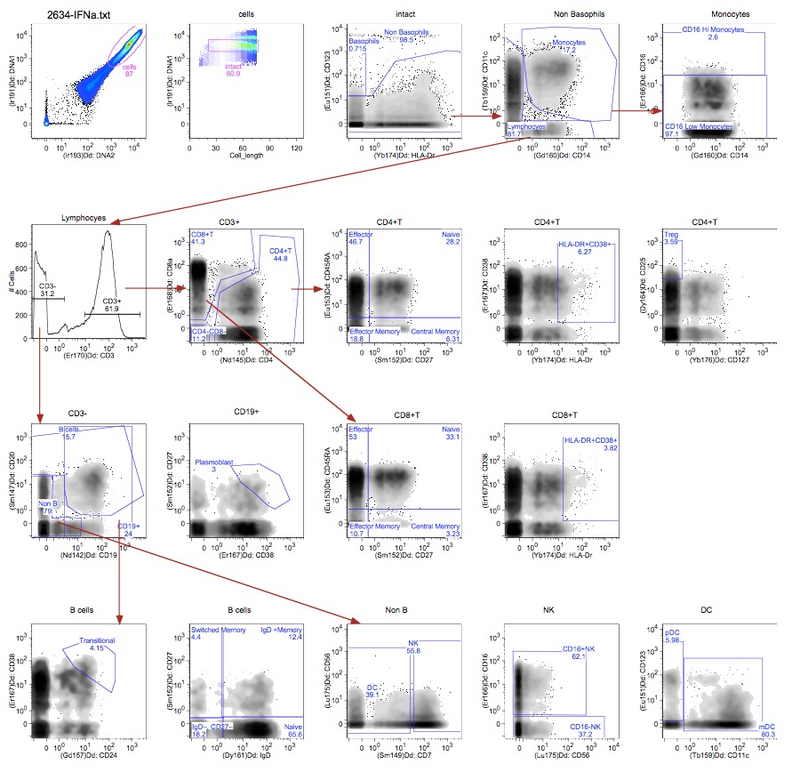 Phosphoflow assays combine phosphoprotein-specific antibodies with the power of flow cytometry to enhance phosphoprotein study. In our assay, peripheral blood mononuclear cells are stimulated by cytokines, fixed, surface-stained with a cocktail of antibodies labeled with MAXPAR (brand name) metal-chelating polymers and permeabilized with methanol. They are then stained with intracellular phospho-specific antibodies. We use a CyTOFTM mass cytometer to acquire the ICP-MS (inductively coupled plasma mass spectrometry) data. The current mass window selected is approximately AW 103-203, which includes the lanthanides used for most antibody labeling, as well as iridium and rhodium for DNA intercalators. Subsequent analysis of the dual count signal data using FlowJo software allows for cell types to be analyzed based on the dual count signal in each mass channel. The percentage of each cell type is determined and reported as a percent of the parent cell type. Median values are reported to quantitate the level of phosphorylation of each protein in response to stimulation. Comparing the level of phosphorylation between samples can offer insight to the status of the immune system. Warm complete RPMI to 37 °C in water bath. Each sample will require 20 ml of complete RPMI with benzonase to limit cell clumping. Calculate the amount needed to thaw all samples, and prepare a separate aliquot of warm media with 1:10,000 benzonase (final concentration 25 U/ml). Remove samples from liquid nitrogen and transport to lab on dry ice. Place 10 ml of warmed benzonase media into a 15 ml tube, making a separate tube for each sample. Thaw frozen vials in 37 °C water bath. When cells are partially thawed, carry to hood. Add 1 ml of warm benzonase media from appropriately labeled centrifuge tube slowly to the cells, then transfer the cells to the centrifuge tube. Rinse vial with more media from centrifuge tube to retrieve all cells. Continue with the rest of the samples as quickly as possible. Centrifuge cells at 1,600 rpm (RCF = 390) for 10 min at room temperature. Remove supernatant from the cells and resuspend the pellet by tapping the tube. Gently resuspend the pellet in 1 ml warmed benzonase media. Centrifuge cells at 1,600 rpm (RCF = 390) for 10 min at room temperature. Remove supernatant from the cells and resuspend the pellet by tapping the tube. Resuspend cells in 1 ml warm complete RPMI. Count cells with Vicell (Vi-Cell XR Beckman Coulter) (or hemocytometer if necessary). To count, take 20 µl cells and dilute with 480 µl PBS in vicell counting chamber. Load onto Vicell as PBMC with a 1:25 dilution factor. Using a multichannel pipette, add 100 µl cells (0.5 x 106 cells) into each of eight wells of a 96-well deep well plate. Rest for another 1 h-1.5 h at 37 °C in CO2 incubator. Prepare the stimulation plate just before stimulation. Prepare cytokines at 5x concentrations, in 500 µl of RPMI in a fresh deep well block. Add enough 5x cytokine (~500 µl for a full plate) into one row of a fresh deep well block to pipette. Remove rested cells in the deep well block from incubator and stimulate by adding 25 µl of 5x cytokines with multichannel pipette to each row of patient samples. Change tips between each patient. Work as rapidly as possible. Tap plate to mix, and incubate 15 min at 37 °C in CO2 incubator. Remove cells from incubator at the 15 min and using a multichannel pipette, add 20 µl 16% PFA (~2.2% PFA final concentration) to each row of patient samples in the deep well block. Pipette up and down to mix for each patient. Change tips between patients. Add PFA in the same order that you added the cytokine stimulation. Add 1.6 ml CyFACS buffer to each well of the deep well block. Centrifuge cells at 974 rcf (x g) for 10 min at 4 °C. The cells are fixed / dead and has to be spun down harder to prevent cell loss. Aspirate supernatant from the cells. Make cocktail in PBS of metal-chelating polymer-labeled surface antibodies according to previously determined titration. Make sufficient volume for each sample to have 20 µl of cocktail. Pipet into 0.1 µm spin filter and centrifuge in a tabletop microcentrifuge (RCF = 14,000) for 5 min at room temperature. Add 20 µl of antibody cocktail to the cells in the deep well plate, vortex to mix and let it incubate at RT for 30 min. Wash cells in 1.6 ml/well x2 with CyFACS buffer and centrifuge cells at 974 rcf (x g) for 8 min at 4 °C. Discard supernatant by aspiration. Permeabilize the cells by adding 600 µl -20 °C cold MeOH to each well of the deep well block using a multichannel pipette. Pipette up and down to mix for each patient. Change tips between patients. Cells are stored overnight at this point at -80 °C. Wash in 1 ml/well CyFACS buffer. Centrifuge cells at 974 rcf (x g) for 10 min at 4 °C. Discard supernatant by aspiration. Wash in 1.8 ml / well CyFACS buffer. Make cocktail in PBS of metal-chelating polymer-labeled intracellular antibodies according to previously determined titration. Make sufficient volume for each sample to have 20 µl of cocktail. Pipet into 0.1 µm spin filter and centrifuge in a tabletop microcentrifuge (RCF = 14,000) for 5 min at room temperature. Add 20 µl of antibody cocktail to the cells in the deep well plate and let it incubate at RT for 30 min. Wash in 1.8 ml/ well CyPBS. Make 1:200 dilution in CyPBS of Ir-intercalator. Add 20 µl of diluted Ir-intercalator solution to each well, pipet to mix. Incubate on ice for 20 min. Wash 1.6 ml/ well x 3 in MilliQ water. Acquire samples on the CyTOF, after standard instrument setup procedures. Staining volumes are kept at a total of 50 to 60 µl. Washing steps are critical to minimize background. Aspirate such that only ~ 100 µl volume is left after each wash. Vortex before the next wash.
Homogeneous staining is aided by thorough resuspension via pipetting up and down. Sample dilution is critical to collecting an optimal number of single cell events; aim for about 300 total events / second. Do not leave sample buffer or wash buffers exposed to air, as dust accumulation can cause clogs. Each sample should be resuspended in water and filtered through nylon mesh just prior to running; do not let samples sit on water overnight, as cells will lyse and clump, causing clogs and loss of events. Note: Do not use FBS! This work was supported by grants S10RR027582, 5U19AI057229, and 5U19AI090019 from the U.S. National Institutes of Health. Bendall, S. C., Simonds, E. F., Qiu, P., Amir el, A. D., Krutzik, P. O., Finck, R., Bruggner, R. V., Melamed, R., Trejo, A., Ornatsky, O. I., Balderas, R. S., Plevritis, S. K., Sachs, K., Pe'er, D., Tanner, S. D. and Nolan, G. P. (2011). 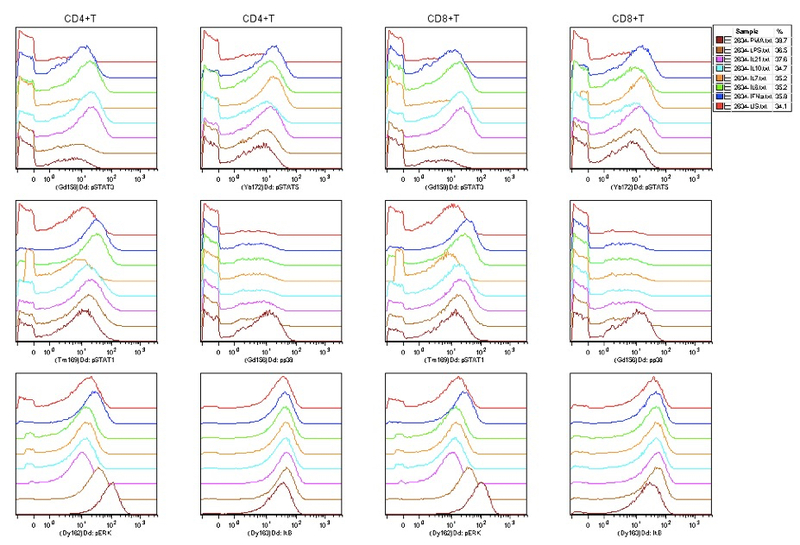 Single-cell mass cytometry of differential immune and drug responses across a human hematopoietic continuum. Science 332(6030): 687-696. How to cite: Fernandez, R. and Maecker, H. T. (2015). Cytokine-stimulated Phosphoflow of PBMC Using CyTOF Mass Cytometry. Bio-protocol 5(11): e1496. DOI: 10.21769/BioProtoc.1496.